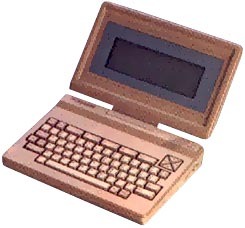 The NEC 8401 A is the second generation NEC notebook portable computer. It is significantly different from the 8201.
the 8401 has a 16-line by 80-column fold-up LCD screen, 64K of RAM, and a built-in 300 baud modem, and can be operated using batteries or an AC adapter. It uses the CP/M operating system and has four built-in software packages including Wordstar-To-Go, Calc-To-Go, Telcom (telecommunications utility), and Filer (personal card filing program). BASIC is not included in the system. The basic package included the computer, phone cable, cassette recorder cable, four manuals, quick reference guide, information about on-line services, and license and warranty cards. The package did not include either an AC adapter or batteries. Optional peripherals include a CRT/disk adapter, micro floppy disk unit, 1200 baud modem, external 32K RAM cartridge, and a wide assortment of cables. Somewhat larger and heavier than the 8201, the 8401 measures 11.8" x 8.4" x2.8" and weighs 4.7 lbs. It uses a CMOS version of the 8-bit Z80 mpu operating at 4 MHz. Built in are three 32K ROMs (96K total) which include the BIOS and applications software. The 64K of RAM is segmented into two 32K blocks, one for storing user programs (called an internal RAM disk) and the other for file creation and manipulation. With an optional floppy disk drive attached, it is possible to allocate all 64K of the computer to program execution. A compartment in the top of the computer accepts four C-cells; alkaline batteries are said to have a life of eight hours or longer. There is an automatic power shutoff if no key has been pressed for ten minutes; this time period may be reset by the user to 1 to 25 minutes. In the 32K portable mode, 32K was used as a ramdisk and 32K was available for programs. In this mode battery backed RAM cartridges could be used as an additional Ramdisk. In the 64K modes the entire 64K was used as program memory and either a RAM cartridge or a disk drive could be used as program storage. The CRT/Disk interface was used as a primitive docking station. the add on periphals connected to the single cartridge slot on the left side of the copmuter. It had a monochrome pixel graphics ability. The TELCOM program did a decent vt100 emulation and included Xmodem file transfer abilities. Like the 8201 there was a function key driven menu shell, and it allowed access to the CP/M Command line. see more NEC PC 8401A Ebay auctions !